UFV formally thanked Coast Capital Savings at a recognition ceremony during the launch of The Standout magazine. Left to right: UFV President Mark Evered, Matthew Atkinson, Coast Capital Savings Cottonwood Branch, Joginderjit Jabal, Coast Capital Savings Clearbrook Branch, Paul Brady, Director of Retail, Investment and Insurance Services for Coast Capital Savings, Hilary Beard, Director of University Advancement, Jody Gordon, VP Students. The university experience is about more than attending lectures, completing assignments, and studying for exams. At least it can be, if students take advantage of the extracurricular and volunteer opportunities available. Students at the University of the Fraser Valley have been able to engage in many leadership opportunities thanks to the support offered by the Coast Capital Savings Student Leadership Institute. 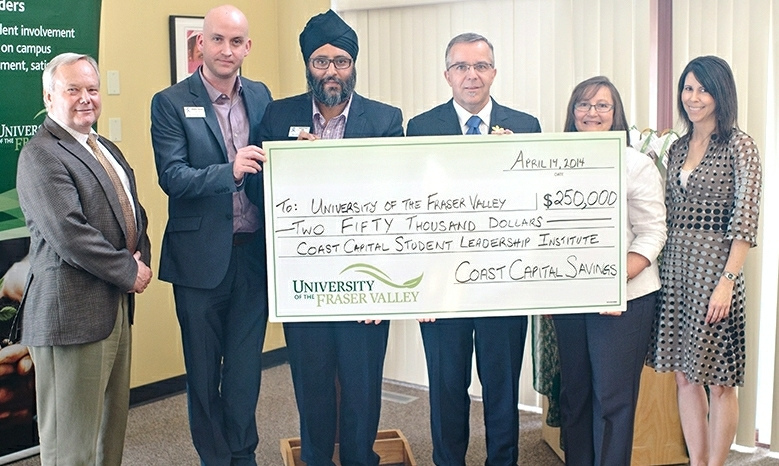 Coast Capital Savings has provided a quarter million dollars in funding for the institute and associated student leadership opportunities at UFV over the past five years. At the recent launch of UFV student leadership magazine The Standout, Coast Capital Savings was recognized for the donation and for being a committed partner of UFV. Paul Brady, Director of Retail, Investment and Insurance Services for Coast Capital Savings, commended UFV for its efforts in the area of student leadership at the recent ceremony. A UFV Student Life initiative, the Coast Capital Savings Student Leadership Institute provides numerous leadership opportunities for 450 students over the course of the academic year. This internationally recognized leadership program challenges students to apply proven leadership techniques through experiential learning activities. These experiences lead to the development of life-long leadership skills. Students who have participated in leadership programs supported by the institute say that the experience has enriched them. “As I approach the end of my nursing program, I would like to continue empowering fellow nursing students to develop their own identities as individuals and as a health care professionals, while encouraging them to do the same for others,” said UFV nursing student Tony Chae. The Coast Capital Savings Student Leadership Institute encourages personal development through experiential learning. Activities include UFV’s recently launched co-curricular record, the Student Ambassador program, the Student Leadership Challenge program, internal and external student leadership conferences and retreats, The Standout (a magazine highlighting student and alumni leaders), the Leadership Speaker Series and an Evening of Recognition event.